Bonjour! Are you hosting a French theme party for a bridal shower or birthday? Planning doesn't have to be too difficult with the help of PartyCheap.com. We can help you to plan the perfect Day in Paris for your guests! If you want your French party to be classy or casual we've got just the right decor for both! We have Embossed Foil Fleur di Lis Silhouettes, French Cutouts, and French Flag Cutouts to help you decorate your French theme party perfectly. 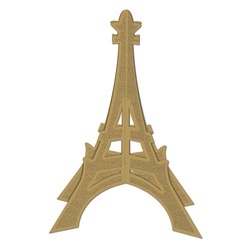 We have a Glittered 3-D Eiffel Tower Centerpiece that would be an excellent touch on your tables and an Eiffel Tower Photo/Balloon Holder that you could use to hold down black and gold balloons! Even if you can't take your party to France, you can bring France to you with the help of PartyCheap! Check out all of our International Decorations too! We also carry several items with a gold fleur de lis motif including the Fleur de Lis Centerpiece Cascade. In addition to the French fleur de lis decorations, PartyCheap offers party supplies bearing the colors of the French flag, like our Patriotic Tablecover which can be used for both French and American patriotic events! These party product styles allow you to create your own unique look for your event. Your French party is sure to be a grand event when you decorate with PartyCheap's French Decorations and Party Supplies! Don't be afraid to check out all of the items listed in our French theme category. Merci Beaucoup!